Private Lessons Series. Musicians Institute Press. Instruction. Softcover with CD. With guitar tablature. 40 pages. Published by Musicians Institute Press (HL.695860). ISBN 0634084755. 9x12 inches. Jean Marc Belkadi Private Lessons. 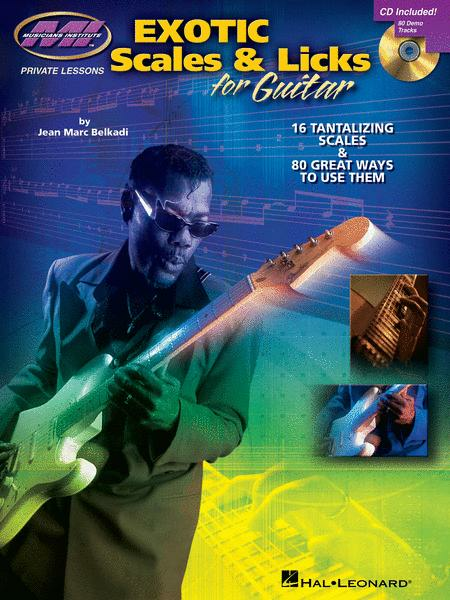 Expand your lead lines and scalar vocabulary with a whole book packed full of unusual scales and interesting ways to play them. The accompanying CD contains 80 demonstration tracks of all the licks in the book. Scales include: Prometheus, enigmatic, Hebrew, Hungarian Gypsy, Hindu, Neapolitan Major, Neapolitan Minor, East Indian, Romanian, double harmonic minor, Persian, double augmented, 8-Tone Spanish, Byzantine, overtone, harmonic major • and more.